I’ve upgraded my office chair to the Ergohuman Executive Chair With Headrest. I had a chair that was less adjustable and was leather, so in the warmer summer months it was not very pleasant to sit on. So far I’m delighted. I’m 6-foot-4 (195cm) and this is one of the only chairs I’ve ever seen that seats my height comfortably, both in terms of seat height and in terms of being tall enough to relax back into (the headrest extends up high enough to support my head and neck nicely). The mesh keeps me nice and cool. The arm rests adjust out of my way if I want. There is plenty of adjustment, but not too much; it is a well-built chair, not a gadget. I read a lot of online reviews and considered a dozen or so chair models before settling on this one. Other reviewers commented highly about the durability. Those who had troubles were very happy with the service they received. A chair is a long-term investment that’s hard to overvalue. If you’re a programmer, you’ll use it day in and day out; you may spend more time in it than out of it. A good quality chair should last ten years, easily; amortize the cost of the chair over that time and it suddenly appears cheap. A typical person will buy enough shoes during that time to pay for many high-quality chairs. I’m a stickler for my equipment; I view it as tools to get my work done. I would never put myself in a bad quality chair. I have nothing bad to say about it. 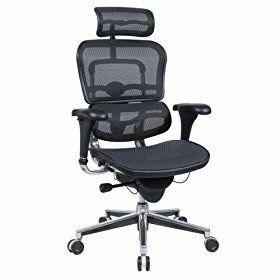 Oh, and it’s certainly a vastly better chair than the Aeron chairs, which are uncomfortable, too short to relax back in, highly overrated, and much more expensive.